The hepatic portal vein is a blood vessel that ensures the circulation of deoxygenated blood from the digestive organs and spleen to the liver. 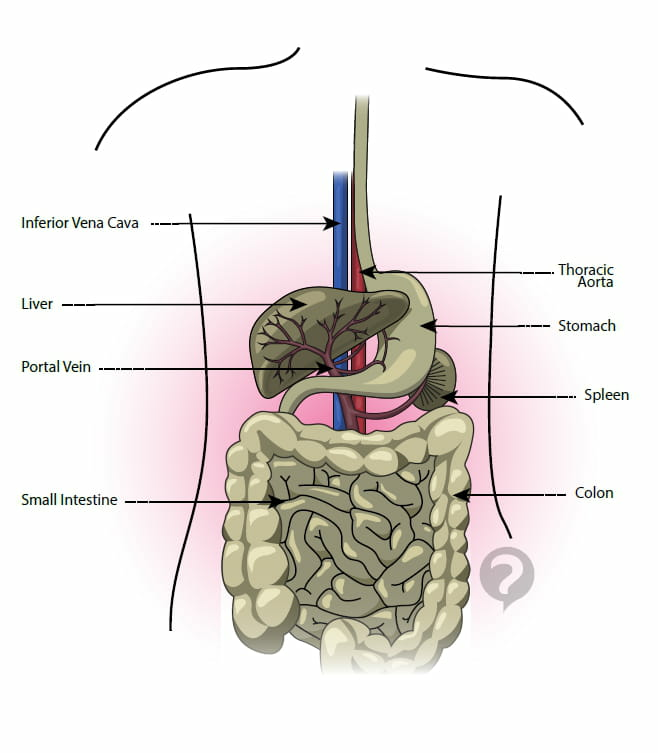 This is a large vein formed by the fusion of the superior mesenteric and splenic veins. The hepatic portal vein branches into two distinct sections, with one branch penetrating each side of the liver. In certain diseases, especially ones affecting the liver, increased blood pressure in the hepatic portal vein leads to a certain number of clinical signs altogether known as portal hypertension. This notably causes enlargement of the spleen, called splenomegaly, fluid accumulating in the abdomen, called ascites, and the development of an abnormally visible superficial venous circulation in the abdomen. Occurrences of esophageal varices, where the veins of this organ are dilated, can lead to severe digestive hemorrhages. Original article published by Jean-François Pillou. Translated by Jean-François Pillou. Latest update on August 19, 2014 at 12:18 PM by christelle.b. This document, titled "Hepatic portal vein - Definition," is available under the Creative Commons license. Any copy, reuse, or modification of the content should be sufficiently credited to CCM Health (health.ccm.net).